rom his open kitchen at Oxlot 9 inside the Southern Hotel in downtown Covington, 2015 Chef to Watch Jeffrey Hansell showcases his love for fresh, local ingredients. 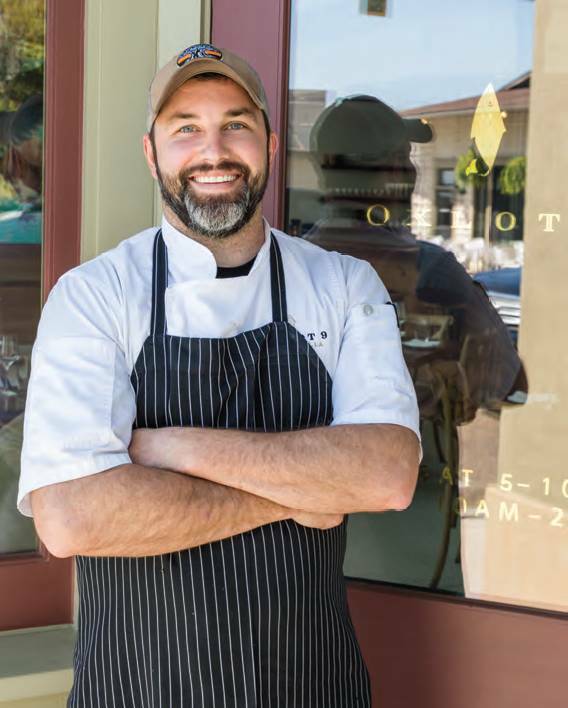 The bounty of Gulf seafood and produce from local farms inspires his menu at the upscale Southern bistro, which constantly evolves based on seasonality. 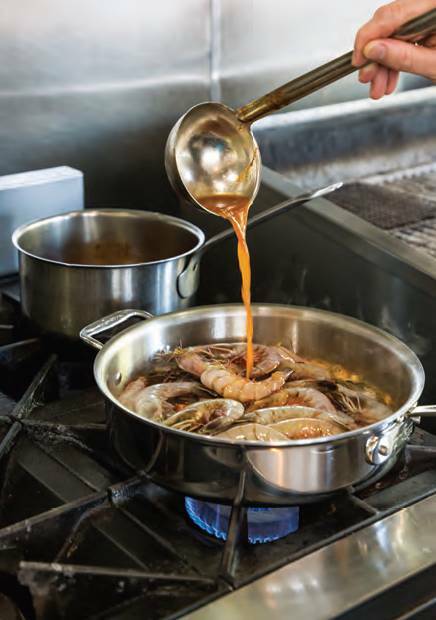 The Mississippi-born chef’s creativity and culinary innovation inspire thoughtful dishes with familiar regional flavors, like his playful, elevated take on a traditional shrimp boil. Q Tell us about this Shrimp Steam Pot. We’ve done a good bit of variations of this dish. We did one two years ago that was somewhat of a bouillabaisse with octopus, shrimp, scallops, mussels, clams, and fish. We did one the year before that was a little more cream-based, a little more wine-heavy, and we did that with fish and shrimp. This one here, we kind of do it during seafood season, during the summer season when shrimp are always available. We evolve it every year. In this one, we’re going for something that you would find in a shrimp boil. 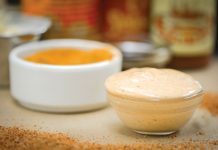 So, you have your carrots and your mushrooms, just getting those familiar flavors and the feel and taste, using the shrimp stock to bring out a heavier, richer flavor than a traditional shrimp boil. This steam pot evolves throughout the year, but it’s getting back to that boiled seafood or that bouillabaisse, or those rich, spicy flavors that you would get, kind of familiarizing yourself with something you’ve had before. Q This dish features head-on, shell-on, tail-on shrimp. What do you like about cooking with those? I mean, you’re getting everything when you cook with a full shrimp—the head especially. There’s all that fat, all that juice that’s kind of contained in there, and when you cook it in the stock and in the dish, it releases all that and just completely changes your dish. It gives it that rich, creamy, kind of fatty taste of the shrimp. Some people are kind of skittish about using their hands to eat, especially at nicer restaurants, but I think that’s the best way to eat shrimp, is to cook it whole. Q When people are buying shrimp, what should they look for? What should they ask? Obviously, where is it from? Buy local. If it’s caught in Louisiana, it’s definitely fresh. Ask when it was caught. The shrimp should smell just like the water it’s caught in: fresh, salty, briny. Definitely shouldn’t have any kind of odor. The shell should be hard, clear, intact. The heads should be attached, with no discoloration or darkening from the iodine in the shrimp—that’s usually a telltale sign of an older shrimp. The color should be the same throughout. Q Tell us about the technique of steaming the shrimp in this dish. Shrimp is extremely delicate. Going 10 or 20 seconds over could completely change the texture of it, so you’re literally just trying to poach them and steam them in that broth. The technique is very quick. You definitely have your liquid simmering, if not a low boil, just like you would be blanching or boiling something. And it’s just kind of knowing how long it’s going to cook and trying to keep it just under that because the shrimp will kind of carry-over cook, so you want to bring it just to that point of it being cooked and then cut it off, and it’s ready to serve it by the time you’re eating it. The shrimp’s going to be done perfect. Q How do you know when shrimp are done? They start to curl. That’s the first sign. Then their shells will start turning kind of that nice, beautiful peachy-orange color. Just from doing it so many times, I can kind of look at it, but there’s always the firmness test. If you’re hesitant, you should be able to pick it up, and it should feel firm. There shouldn’t be too much give in the shrimp, and when all else fails, you can just grab one out of there and break it in half, and if it’s not done, let it go a little longer. You don’t want to lose any shrimp. The worst thing you could do is overcook it. Q What tips do you have for switching up the elements of this steam pot as the seasons change? The core ingredients can be interchanged throughout the seasons. During the fall, you could easily put turnips or some root vegetables or potatoes in there. It’s all about what you want out of the dish or what you’re feeling as far as flavors. And again with seafood, try to cook what’s in season. If you’ve got crawfish, throw some crawfish in there. If you’ve got some great fish coming in, or soft-shell crabs are in season, throw a soft-shell in there. It’s only going to add to the dish. 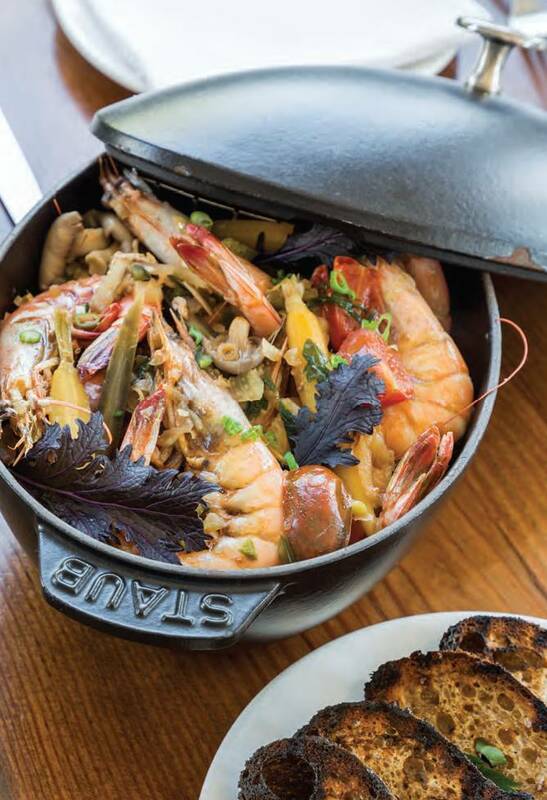 Q What would you pair with this Shrimp Steam Pot? A cold beer would be great—a light pilsner or something like that. A good Riesling would go great with it. Heat a medium heavy-bottomed saucepan over high heat. Once hot, add oil. Add carrots, poblano, fennel, and shallots; sauté until vegetables get some color. Add garlic; sauté for 1 minute. Add mushrooms and tomatoes; sauté for about 1 minute. Add verjus, butter, lemon juice, parsley, thyme, tarragon, and hot sauce; cook for about 2 minutes. Pour 2 cups shrimp stock over vegetable mixture. Bring liquid to a boil. Reduce heat to a simmer; add shrimp in an even layer. Add remaining 1 cup shrimp stock. Cover and cook for about 2 minutes. Season with salt and pepper to taste. Remove from heat. 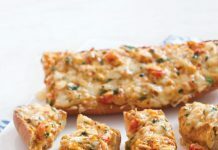 Serve with toasted or grilled bread slices. Garnish with green onion and shiso, if desired. *A sweeter, low-alcohol white wine may be substituted.